Almost all babies suffer from nappy rash at some point and it's a very common condition, affecting about one in three of all infants. But seeing your baby's bottom inflamed and red can be distressing and it's not nice for infants. So why does it occur, what can you do about it and how can you reduce the chance of it flaring up again? As the name suggests, nappy rash is a form of rash that occurs on the skin around or under a baby's nappy. It can make your baby feel very uncomfortable, which is often reflected in crying and irritability, but the good news is that it's a common condition and generally nothing to be seriously concerned about. It's certainly not a disease of any kind. Nappy rash can be caused for various reasons, but the main factors involved are a dirty nappy that's been left on for too long and is touching the skin, a chemical irritation due to the ammonia found in urine and bacteria in the stools. All of these issues cause the normal protective barrier on the skin to break down, causing inflamed and irritated skin. The symptoms of nappy rash are relatively easy to identify. It causes redness in the nappy area, which can be spotty or blotchy. Sometimes it extends down over the legs or up onto the stomach. Changing your baby's nappy frequently, so a wet nappy doesn't come into contact with their skin too much. Wash and dry your baby's bottom carefully. Try using barrier creams, such as zinc, to help stop the nappy rash. The cream will protect the sore skin and is particularly good if your baby has sensitive skin. Some contain antiseptics too, which are good for healing and warding off any germs. Leave the nappy off for a while each day, so your baby's bottom can enjoy some warm dry air (if you're worried about accidents, put your baby on a big towel!). Avoid using plastic pants and instead opt for woollen underwear on top of the nappy. Sometimes what seems to be nappy rash might in fact be a candida infection such as thrush, which would need to be treated with antifungal cream. Babies with sensitive skin or other skin problems are particularly prone to this and, when thrush is involved, the rash will have clusters of little red spots around the edge of the main rash. It's also important to see a doctor immediately if your baby's skin becomes very red, swollen and warm and if he has a temperature, as this may mean he has a bacterial infection and it would need treatment. In either case, if you're unsure about the cause, if the nappy rash doesn't seem to be clearing up or gets worse, then seek advice from a doctor or health visitor. Change nappies as soon as they are wet or soiled. With newborn babies, this may be as frequently as every hour. Remember to change nappies before you put your baby down to sleep, or after you've fed him. 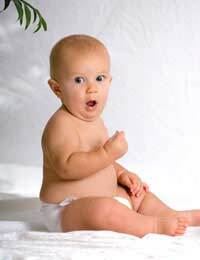 Wash your baby's bottom with warm water and a mild soap (look out for brands designed especially for babies). Use cotton wool or wet wipes to properly clean your baby's bottom. Air is really good, so try and let your baby lie in a warm room without a nappy before you put another one on. Sometimes babies with sensitive skin can be affected by washing powder and this can irritate if you're using washable towelling nappies. No-one likes to see their baby suffering, but nappy rash is relatively harmless and can be successfully treated, so do your best to help clear it up and prevent it. Baby Poo: What's Normal, What's Not?